"DO NOT READ YOUTUBE COMMENTS"
Now Google has tried to clean up the place with some G+ integration - forcing users to use real names or at least pseudonyms - which appears to have made some improvement. 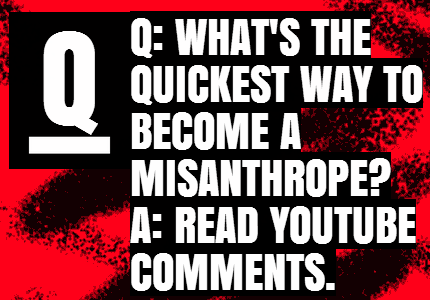 Still, there are far more productive ways to spend your time than reading YouTube comments. Now, you could just avoid going there at all (who're we kidding here?!) but there has to be an easier way to watch cat videos without the bilious side effects right? The wonderful thing about the internet is that whatever problem you might have, it is highly likely that someone else has faced it before you and done something about it. Depending on the browser you use there are many extensions which allow you to hide those pesky comments. Some work only on Youtube while others do a good job on many sites. Chrome - being the most popular browser - has very good extensions which accomplish just that. The one I use and recommend is called Magic Actions for YouTube™. It is a free and fantastic app that allows fine grained control over the entire video watching experience. It has quite a number of options that can seem overwhelming to new users but don't let that put you off. 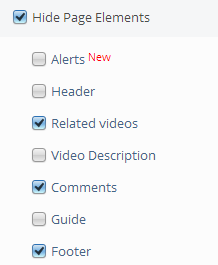 Once you've installed it, the first thing you should do is disable comments. You can find it under the section called 'Hide Page Elements' like in the screenshot on the left. Enable AutoHD - automatically plays the best available resolution version of the video. That last option can also be used to force low-res streaming if you want to save bandwidth. There are many other things you can change like enabling auto-replay, changing the colors for Cinema view and hiding other page elements like headers, footers, related videos etc. In fact, (mostly) whatever annoys you about YouTube can be fixed with this add-on. So what are you waiting for? Download and install the extension for a stress-free video watching binge!